Toufayan has taken its 85 years of making fresh pita and created a unique, all natural, crispy, crunchy snack that recognizes how families want to really enjoy pita chips: with their favorite dips. 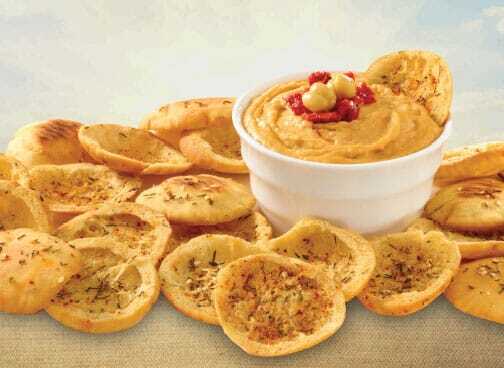 So, we created the first and only pita chip with a pocket to capture the goodness of your favorite dips. New Toufayan Scoop-Able Pita Chips. Because they’re so crunchy and tasty, you may even be tempted to enjoy them all by themselves. What are the ingredients for the sea salt pita chips and the multigrain chia pita chips? I can’t seem to find them on the website. Thanks! Thank you for your interest, Quinn. Ingredients: enriched wheat flour (wheat flour, malted barley flour, niacin, iron, thiamin mononitrate, riboflavin, folic acid), sunflower oil, water, sea salt, yeast, wheat gluten, contains 2% or less of the following: sugar, oat fiber, salt. Processed on equipment that also processes soy and milk. Ingredients: water, whole wheat flour, enriched wheat flour (wheat flour, malted barley flour, niacin, iron, thiamin mononitrate, riboflavin, folic acid), sunflower oil, sea salt, yeast, contains 2% or less of the following: wheat gluten, sugar, wheat, rye, corn, oats, triticale, brown rice, barley, millet, flax seed, oat fiber, salt, chia seeds. Hello! I saw your ad on specialty food news’s website, and was wondering if you deliver to, or have a distributor in brooklyn, NY? Could we get pricing and samples of your pita chips, both the scoops and the gluten free variety? Thank you! Hello Laura, please contact a sales representative via our contact page or email us at info@toufayan.com. Hi I just discovered these pita chips and I like the caramelized onion flavor, but the chipotle flavor smells like ash. I do not like the taste of chipotle pita chips. We’re glad to hear you enjoy the Caramelized Onion Gluten Free Pita Chips. I’m sorry you don’t like the Smoked Chipotle flavor, personally, I love the the smokey flavor and find the smokiness to be quite appetizing. Can you tell us where you purchased your Gluten Free Pita Chips? This classic will keep you coming back for more!